Good news! We are extending the Experience New Moon celebration through to Christmas! For those who couldn’t make it to the New Moon release weekend we have continued the Oregon Food Bank fundraiser, Self-guided Twilight Set Tour, Twilight Scavenger Hunt, giveaways and drawings. You can now participate online! We will be giving away one prize each Monday until Christmas week.The prizes and winners are listed below.To enter the drawing simply submit your name and contact info. 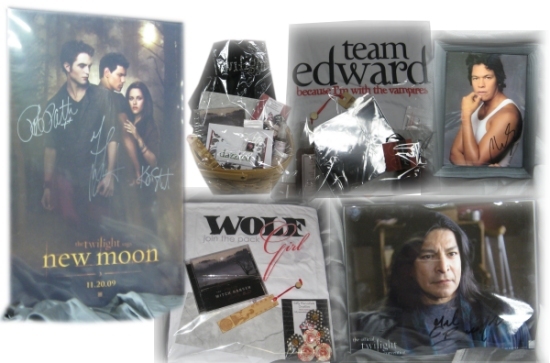 Some of the prizes, including autographed photos donated by Lana Veenker & an autographed New Moon poster!